Disclaimer: This page is meant as an informative look strictly on the U grade service provided by AFA. In no way is it meant to sway collectors from using the other services that they provide. What is the U grade? The U grade is the process in which a person will send a figure still sealed onto its original card or baggie to AFA, AFA then opens the package, inspects the figure, assigns it a number based on condition with a U in front of the number, and then seals it into an acrylic case with a sticker containing the U and number. The U stands for Uncirculated, meaning that the figure was never removed from the package until AFA did so. 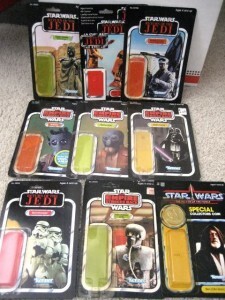 The vintage Star Wars line was produced from roughly 1978-1985. There is only a finite number of packaged figures still available today and that number shrinks every day because of the U grade. 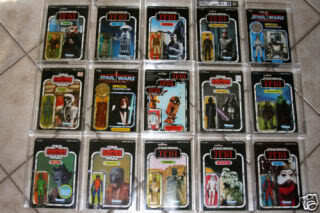 If the U trend continues, eventually, there will not be as much of a supply for collectors/future collectors to collect. Which could eventually kill the hobby that we love. It’s my stuff, can’t I just collect how I want? Of course you can! 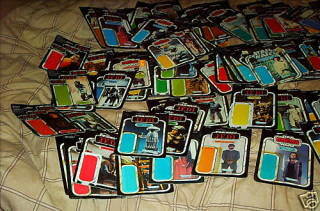 It is ultimately the collectors decision to decide how they want to collect. My intent is not to tell someone how they should collect, but I think some don’t take the time to think about what it is they are doing in the overall scheme of things. My intent with this page is to share information and then I leave it up to the collector to do what they want with that information. What is the difference between a 90 and a U90? In reality, not much. A 90 and a U90 should be identical if AFA grades the figures accordingly. The only difference is that one was pulled from a sealed card or baggie. This is why many of those against U grading feel that AFA collectors are collecting more for the label and not the figure. The fact that you have a nice mint figure should be the important part and there are still plenty of loose specimens that fit the bill, without having to open a sealed one. 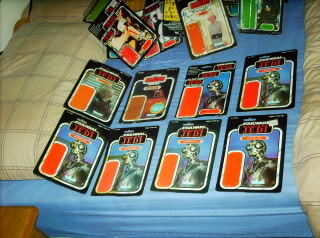 Below is a picture of a regular 90 and U90 graded figures. Can you tell the difference? Isn’t it okay if I only submit figures on very badly damaged cards? One would think so, as many collectors do only go for high end items, but what about those collectors with limited budgets? They are more willing to accept some flaws on their cards. There is also the fact that some carded examples of a certain figure exist in small numbers or aren’t confirmed yet to exist. One of these could turn up and it would never be documented because it was taken off the card and put into the case for the U grade. In a case like this, even a badly damaged card, could be worth a lot to a collector. Below is a Luke Jedi carded figure with a sought after sku sticker in the upper left corner. To a U collector this would be a perfect specimen to submit for U grading, but this is not a very easy carded variation to find. It can’t make that big of a difference, can it? It actually can and does add up. As more collectors start collecting the U grade, more and more figures are being destroyed. Some sellers are sending in large amounts of carded figures to try and get high U grades to turn around and sell for a large profit. Here are some examples of a nice set of AFA carded figures that had their cases opened and were resubmitted to AFA for U grading. And another example of the aftermath of a seller submitting figures for a U grade. Those examples are just basic figures. Is there any damage actually being done to anything rare? Yes, this is one of the more extreme cases of a one of a kind type item. Here we have a Double Telescoping Ben Kenobi and Darth Vader, two extremely rare figures by any standard, but in this case they were salesman samples for Irwin Toys, The Canadian distributer for Star Wars. The owner of these had them removed from their cards and put into this elaborate AFA case with U grades. Thus destroying a pice of history behind the toys. The bubbles on these were supposedly pretty fragile, but AFA could have come up with a case to try and preserve them and avoid further damage instead of having them opened. 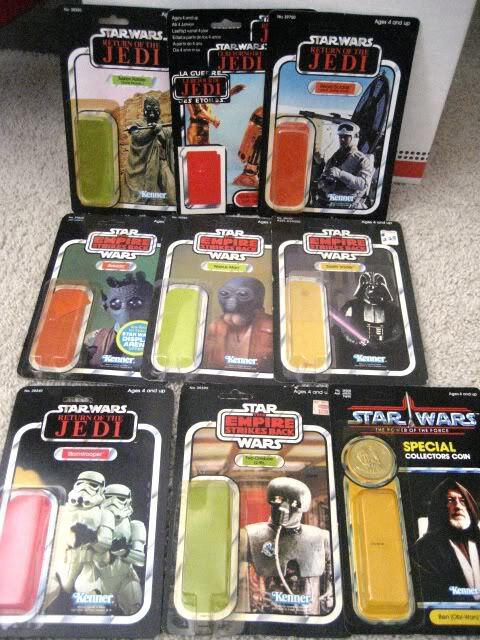 They would have received a low grade in that case, but the certificate of authenticity from the Irwin Toys Employee documented the provenance of these pieces. What about reproductions? Every time I buy a figure on ebay and send it to AFA, it gets rejected because of a fake weapon/accessory. Reproductions are a serious problem in this hobby and I know some collectors go for U grade items as a way to avoid them. However, there are some great resources to help with determining if an accessory is a reproduction. The Jawa Armory has been around for several years and the newer site The Imperial Gunnery are both great resources to help spot reproductions. They have high quality photos and show the subtle differences that are key in making sure an accessory is original. 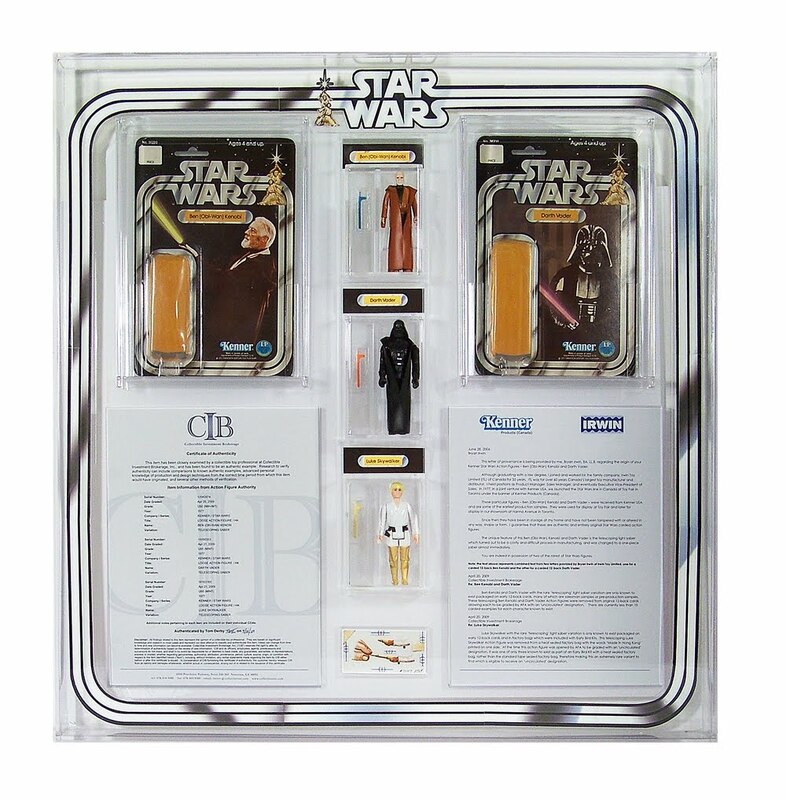 There are also great forums that you can discuss reproductions with other collectors, these include: Rebelscum, Imperial Gunnery, and starwarsforum.co.uk. There are many collectors out there more than willing to help with identification. Do you really expect anyone to change their mind on U grading after reading all of this? I certainly hope so. I’ve seen a few collectors that have decided to no longer collect U graded figures, after some discussion, and feel that this page will have been worth the effort if only one collector reconsiders. One example of a collector changing, is a friend of mine, Craig Thomas. You can read the entire discussion at U Grading Love it or Hate it but here is an excerpt of what he had to say. Why on earth did I collect them in the first place I can hear you say? Honestly; I don’t know! A massive lack of education I guess and pure ignorance of the destructive nature of this type of collecting. This first forum I have ever joined so I’m only starting to see other collector’s opinions and wisdom. I can surely say though if TIG was around when I started this focus then I wouldn’t have got involved. I started by getting the U90 POTF figures. I never had the POTF line when I was a kid so my thinking was if I collected 1 of each POTF figure as a U grade then it would be like my second chance of being the original owner of some nice figures. At the time I wanted the best and the U90 grades were relatively cheap and I started picking them off quite easily. I also started picking up the bounty hunters since no one was getting them either. 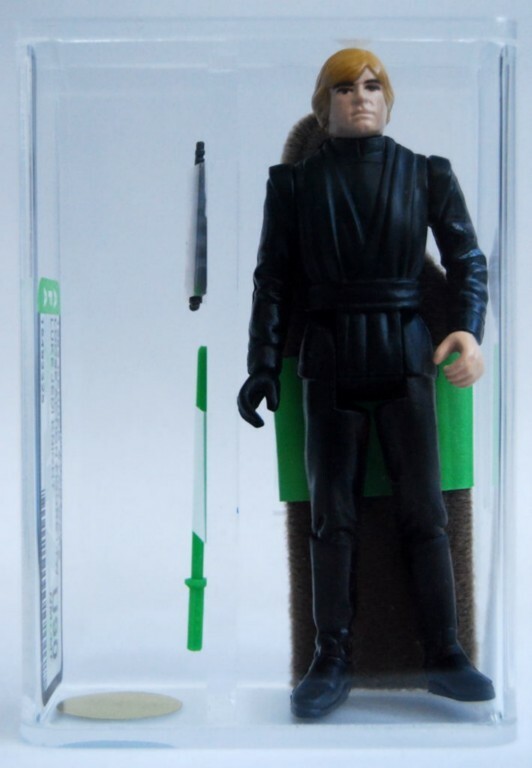 At the time I foolishly believed that AFA only “U” graded a carded figure that was so damaged it would be better for the figure to be encased loose, e.g. cut cards, black bubble etc. In a warped way I had no guilty conscience whatsoever in what I was doing. I haven’t bought a U90 since last September; I think the only reason why I stopped at the time was because of the massive surge in prices that came from nowhere. I had no idea that “star wars collectors” and the AFA for that matter would sacrifice such beautiful cards just to get a U90 grade. 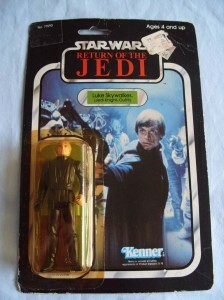 I started to realise what I had done was really bad when I started my Luke Jedi character focus. Many important carded variations of this figure’s evolution may now be lost forever because dealers have sent so many to their grave. I have found it particularly difficult to track down certain variations which I can recall being everywhere only a few years back. 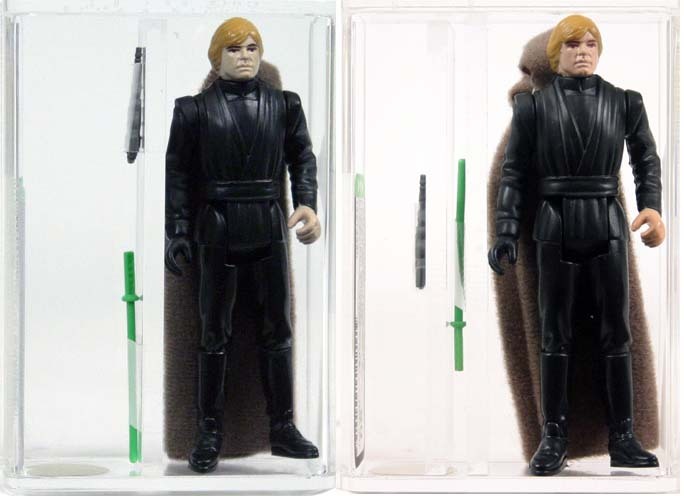 If this is what is happing to Luke, which in general was a pretty well realised figure, then I can only imagine what happing to the earlier SW/ESB figures where the paint and quality was a little hit and miss. There might be 50 perfectly good carded specimens destroyed just to find one that will reach 90. And for that I feel sick and I am truly sorry. This is good and all, but how do other collectors feel about this? There has been much discussion about the U grade since its introduction. It has even driven some long time collectors into considering leaving the hobby. Here are a few discussions about the U grade on the various collector forums. “U” Grading… Love it, or hate it??? and last but not least is another collector who recently changed his mind about the U grade. He ended up opening the AFA acrylic cases that all his figures were stored in. However, I personally believe, that he should have resold those U figures to other U collectors to prevent even more figures from being opened. Joe O’Brien for the 2009 AFA statistics. 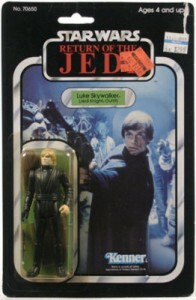 Craig Thomas for the picture of the SKU sticker Luke Jedi and sharing his story.